Implant-supported fixed bridges are growing in popularity because they offer superior support to traditional bridges or dentures. They can also improve bone health thanks to the affinity between bone cells and the implants' titanium posts. Even so, you'll still need to stay alert to the threat of periodontal (gum) disease. This bacterial infection usually triggered by dental plaque could ultimately infect the underlying bone and cause it to deteriorate. As a result the implants could loosen and cause you to lose your bridgework. To avoid this you'll need to be as diligent with removing plaque from around your implants as you would with natural teeth. The best means for doing this is to floss around each implant post between the bridgework and the natural gums. This type of flossing is quite different than with natural teeth where you work the floss in between each tooth. With your bridgework you'll need to thread the floss between it and the gums with the help of a floss threader, a small handheld device with a loop on one end and a stiff flat edge on the other. To use it you'll first pull off about 18" of dental floss and thread it through the loop. You'll then gently work the sharper end between the gums and bridge from the cheek side toward the tongue. Once through to the tongue side, you'll hold one end of the floss and pull the floss threader away with the other until the floss is now underneath the bridge. You'll then loop each end of the floss around your fingers on each hand and work the floss up and down the sides of the nearest tooth or implant. You'll then release one hand from the floss and pull the floss out from beneath the bridge. Rethread it in the threader and move to the next section of the bridge and clean those implants. 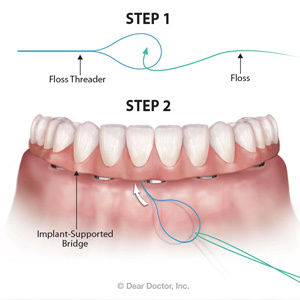 You can also use other methods like specialized floss with stiffened ends for threading, an oral irrigator (or "water flosser") that emits a pressurized spray of water to loosen plaque, or an interproximal brush that can reach into narrow spaces. If you choose an interproximal brush, however, be sure it's not made with metal wire, which can scratch the implant and create microscopic crevices for plaque. Use the method you and your dentist think best to keep your implants plaque-free. Doing so will help reduce your risk of a gum infection that could endanger your implant-supported bridgework. Accidents happen, especially to teenagers involved with sports or similar activities. In an instant they can lose one or more teeth and permanently alter their smile. Fortunately we can restore a teenager’s lost teeth, but often not immediately as a permanent restoration with a dental implant requires maturity of their jaw structure. Our focus then turns to the age of the patient and the condition of the underlying bone. A future dental implant, your best choice for tooth replacement, depends on bone for support, but also the age of the patient as it relates to jaw development. 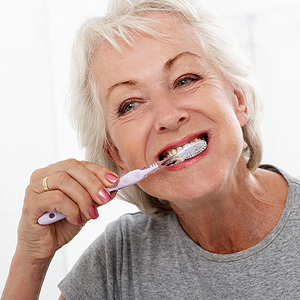 There are a couple of ways an accidental tooth loss can harm supporting bone: first and foremost, the impact of the accident itself can damage the bony socket. To find out for sure we may need to perform a cone beam scan, a type of x-ray that allows us to view the area three-dimensionally. 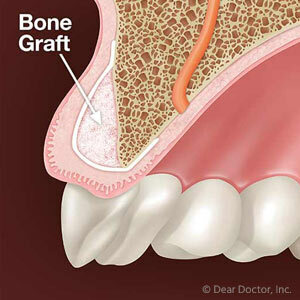 If we do find damage, we can attempt to repair the socket through bone grafting. Bone can also suffer from the long-term absence of a tooth. Bone has a growth cycle in which older cells dissolve and new ones form to take their place. The force generated by teeth when we eat or chew helps stimulate this growth. Without stimulation, as with a missing tooth, the bone may not grow at a healthy rate. In time, it could lose some of its volume and density and not be able to support an implant. Installing an implant right after tooth loss could help avoid this situation. Bone has a natural affinity with the titanium post imbedded in the jaw and will naturally grow and adhere to it. But we can’t place an implant with a teenager. This is because the jaw is still developing so an implant would gradually become misaligned as the jaw grows. It’s best to install an implant later after full jaw development in early adulthood. 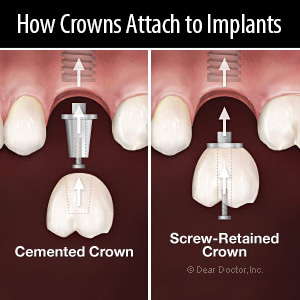 Today, we can place a bone graft in the empty socket right after tooth loss. The graft serves as a scaffold for bone cells to grow on and will help keep the bone volume at a healthy level until we can install an implant. Timing is everything in restoring a teenager’s accidental tooth loss. But with coordination and care for the supporting bone, a teenager can eventually enter their adult years with their smile intact.